You can access the favorites (or favourites depending on your location) window using the button found at the top right of the main diary screen. It lets you quickly add products you have used before to your daily diary. Along the top of the window you will see tabs, ‘TOP’, ‘AB’, ‘CD’ etc. Selecting the ‘TOP’ tab will list the products you use the most often. As you use the software this feature becomes increasingly useful as the software is effectively getting to know your favorite products. The ‘AB’, ‘CD’ etc tabs list the food items you have added by their first letter, ‘AB’ lists products starting with A or B. The groups tab in all versions prior to v3.2 contains a list of the groups you have created in the main diary. Groups can contain two or more items. For example if you have a recipe you eat on a regular basis you can select a date in the past with no data and add all the ingredients to the diary. You can then select all the ingredients and use the group button to group them. The name you give to this group will then be listed in this tab, so you can simply select it later. All the recipe parts will be added to your current diary. Groups are very flexible and used correctly can save you time, another example of a common use for the group option would be coffee with milk, or bread with butter. The groups tab in version 3.2 or later now takes you to the dedicated groups and recipe manager. The groups and recipe manager lets you create new food groups, add or remove items from the groups, and insert the groups into your diary either as a ‘whole group’ or in partial, or multiple units (for example 1/8th of a pie). For more information on the new groups and recipie manager click here. The easiest way to add your favorite items to your diary is to drag them from the top box into the bottom box (the blue box). 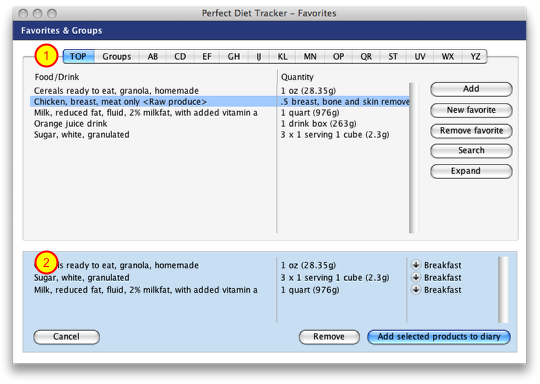 You can change tabs to list different foods and simply drag any products you want to add to the current day into the blue box. You can also double click an item to add it, or select an item and click the ‘Add’ button. If you want to change the meal title selection for any item in the blue box simply click the arrow next to the meal name, if you add a product to the blue box by mistake you can select it and click the ‘Remove’ button to remove it. Once you have all the products in the blue box simply click the ‘Add selected products to diary’ button. 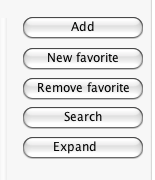 The tool buttons can help you make the most of the favorites window. Adds the currently selected item to the blue box. The items in your favorites automatically appear when you add products to your diary, however if you want to add a favorite product without adding it to your diary you can use the ‘New favorite’ button. The items in your favorites automatically appear when you add products to your diary, if you would like to remove an item you can use the ‘Remove favorite’ button. The search button will ask you what you are looking for, then search your favorites for the desired item. Each item in your diary is automatically added to your favorites. This can result in multiple entries for common products that differ in serving size or the selected meal. When the listings are compressed only a few of the more popular listings for each item are shown so you can add them and change the meal or quantity to suit later. If you click the ‘Expand’ button all listings will be shown.